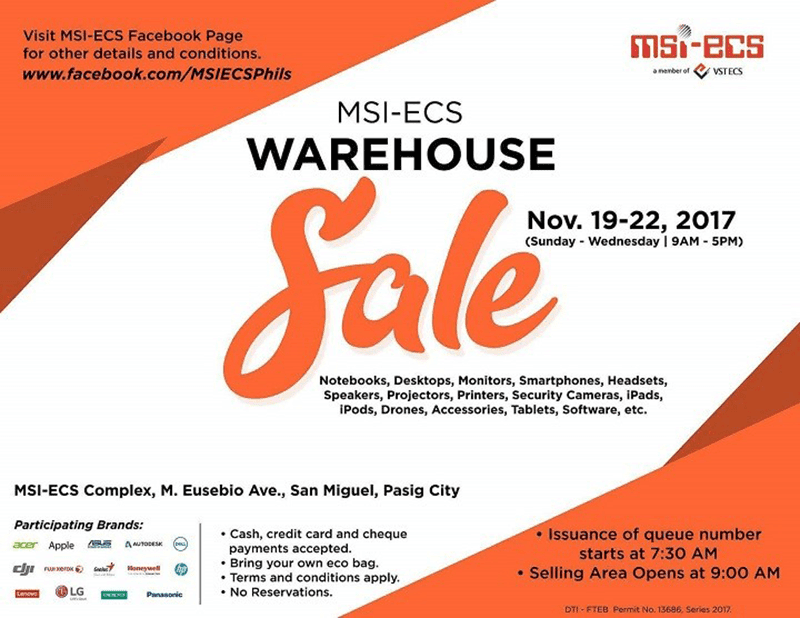 MSI-ECS, will hold a their annual Warehouse Sale from November 19 - 22. Notebooks, monitors, desktops, and more will be available at a discounted price. Many of the leading brands will participate on this sale. Apple, Acer, ASUS, DJI, OPPO, LG and Dell are some of the brands who will be participating among others. Discounts and price cuts will be up to 50%. Even though they are expecting a lot of techy peeps to show up for the sale, items will only have limited stocks so they encourage you to come as early as you can. According to their sale guidelines, there will be strictly no reservations. They want to keep it an even playing field for every one who wants to participate during the warehouse sale. In order to manage the queue, queue numbers will be distributed starting at 7:30 AM. The sales area will open at 9:00 AM. Bringing your own shopping bag is highly encouraged as well. Payment methods that will be accepted during the sale include cash, credit card and cheque. Credit cards from major banks such as BDO, RCBC, Metrobank and BPI can be used for installment payments. Debit cards are only accepted for straight payments. The warehouse sale will be held at the MSI-ECS Complex in San Miguel, Pasig City. You can check the pricelist here.